A very important part of any stringed instrument is the string nut. This valuable piece of hard material holds the strings at a certain height above the fingerboard and frets and sets the spacing of the strings over the neck. Slots are filed into the nut to guide the strings and must be critically adjusted to the right angle, width, and depth. The strings must be low enough to be comfortable, but not so low that the instrument buzzes when open strings are played. The slots may buzz or bind the strings causing tuning problems if not filed correctly. Traditionally the nut is made from bone. Plastic, synthetics, and brass are other materials sometimes used. At GTS we believe bone is the best material for adjustment and long life. Every instrument is different so we prefer to make them custom. Molded replacements are rarely the correct size or spacing. Even the molded nuts will need adjustment. So here is a step by step in pictures of a bone nut being installed. Here the bone blank is sized to fit snugly in the nut slot and flat to the bottom of the slot. A radius is shaped into the blank if the nut slot has a radius like on vintage Fenders. After taking into account the height of the frets and the size of the strings that will be used, some of the excess material is taken off the top. Then the 1st and 6th string (high and low "E" on a guitar) are installed and their slots are cut taking great care in their position over the frets. They must not be too wide or the player may "fall off" the end of the fretboard while playing and they must not be too narrow or the string spacing will be cramped. All music is mathematics and so is a lot of a luthier's work. After the outside string slots have been established the remaining strings are installed and slots are cut so that the SPACE BETWEEN the strings is equal. Since the strings all have different diameters some math is needed to calculate where their slots should be cut to achieve this. If you were to simply divide the space between the outside strings without taking the diameter of the strings into account, the strings on the bass side would be more crowded than the treble side. So the space is measured, the inner four string diameters are subtracted and this is divided by 5. We are left with a measurement that we can dial up on our calipers and use to place the strings with equal spacing. This makes for a better playing instrument. Slots are cut to depth, ends are trimmed, nut is shaped and polished. After the spacing is correct, the nut slots must be cut to the correct depth, angle, and slot width. Special nut files are used for each string. Errors here can cause buzzing or binding strings. This work takes much patience and practice. 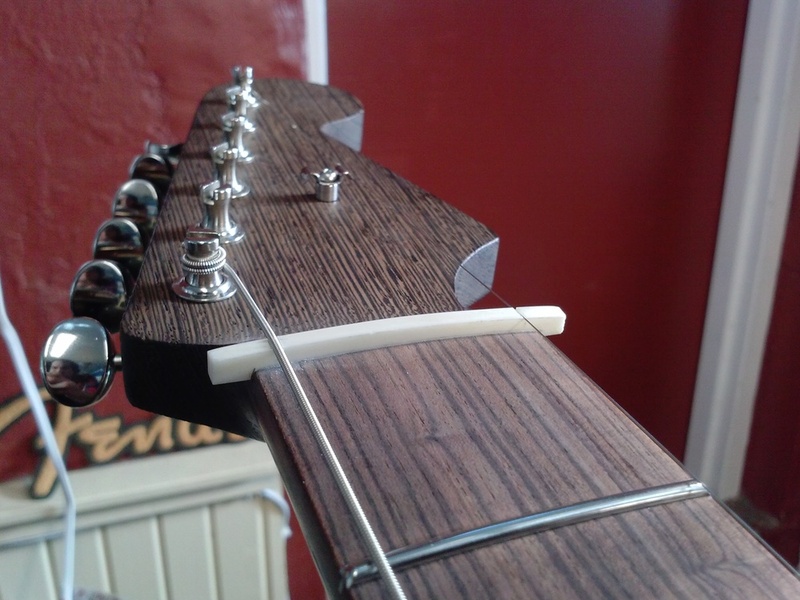 Once all of the strings are at the correct depth the ends of the nut are trimmed flush with fingerboard. 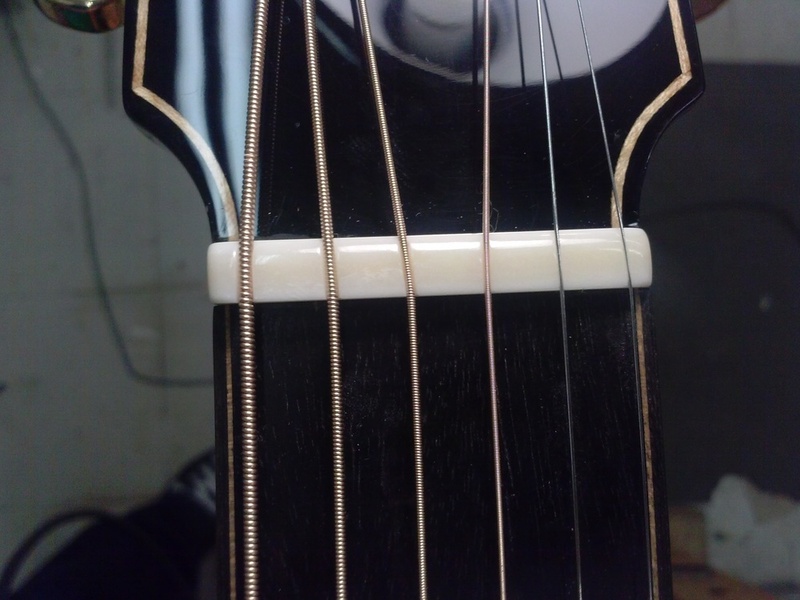 More material may be removed from the top for correct exposure of the strings. Then the nut is shaped and polished to be comfortable and beautiful.